DeWalt needs no introduction in the market. They are one of the best all around the world. DeWalt is an American firm that has specialized in different areas. Including, designing hand tools, power tools, and air compressors for all industrial purposes. So, are you looking to reduce your labor and get an air compressor that works a little bit longer? Then this is the perfect 30-gallon air compressor for you. DeWalt DXCm271.COM provides more than 80% more air tool run time compared to any other 200 PSI air compressor. It is also a compact choice that will save on space. Furthermore, the tool is oil free. Which implies that you should not worry about noise or regular maintenance. As a matter of fact, with its decibel level of 78, it is more than 30 percent quieter compared to other oil-free air compressors. 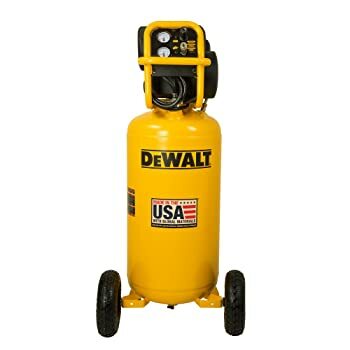 DeWalt’s outstanding expertise in the realm of air compressors is a clear portrayal of why you ought to pick the product. All their tools work distinctively and with utter perfection. They never disappoint their clients, and this 30-gallon air compressor is no different.